It is always an absolute pleasure to talk to people who love buildings just as much as I do which is exactly what happened when I met Ben Copper of Nutshell Construction during a tour of Brook Place near Horsham. Brook Place dates from the early 17th Century, if not earlier, and was once part of Brook Farm. The main building features two principal storeys on an irregular E-shaped plan with roof rooms above. The site was known as ‘Birchen Ersh’ which translates as ‘the good land overgrown with birch trees’. I saw little in the way of birches but discovered an abundance of oak – within the house itself. Brook Place owes much of its current form to famous Sussex architect Frederick Wheeler who lovingly transformed what was a working farmhouse into a grand country home with an Arts & Crafts theme in 1911 after a period of neglect. The building’s oak windows were certainly added at this time though much is unclear, despite the commissioning of a detailed Oxford Archaeology survey. 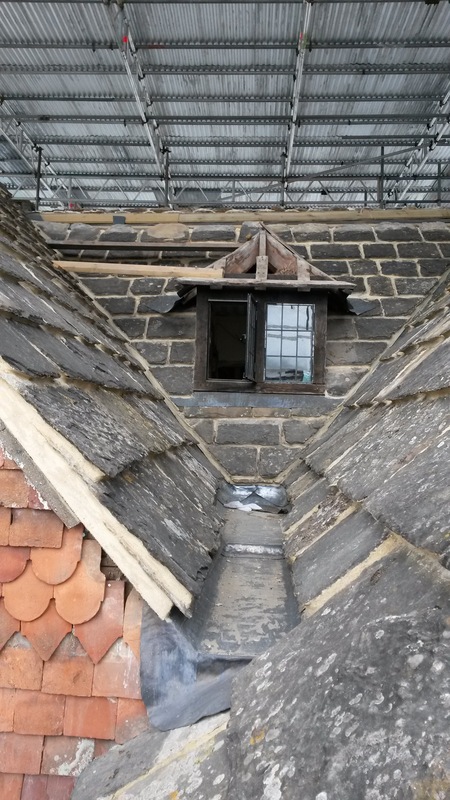 I visited with Ben during the course of a huge works project which his firm is carrying out that involves refurbishing the stone roof, restoring the oak frame, rearranging the interior layout and adding a green oak kitchen extension. The exterior consists of a variety of materials including original oak beams, lime render, sandstone ashlars, hung tiles and brick. Matching Roman numerals on adjoining pieces of oak show how carpenters once planned their work. Careful planning now means that any oak that has to be removed is being recycled as pegs and fillets during repairs, so that the amount of new oak that is needed is kept to a minimum. 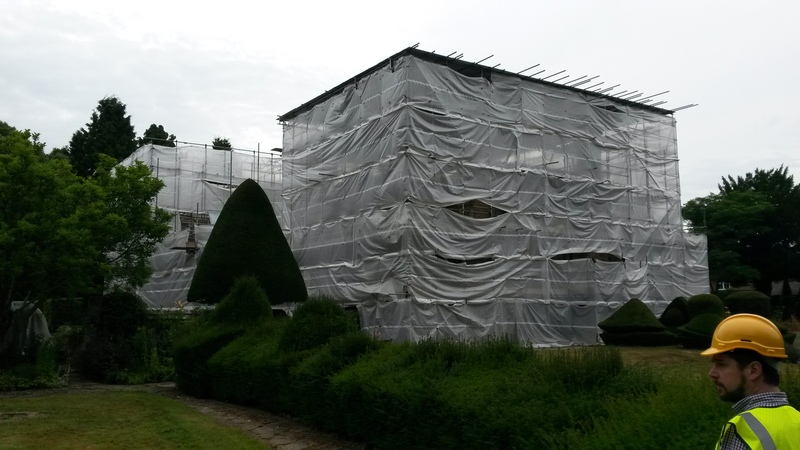 Due to the presence of one of the most thorough scaffolding installations that I have ever seen, I did not know what Brook Place actually looked like until I got home and looked it up on the computer. It is a fine building with impressive gables and a most curious roof that is made up of a variety of sizes of Horsham Stone slabs. Small holes allow bats inside and a bat-friendly lining helps them to cling on. Nushell’s attention to detail is second to none. Ben’s own family history can actually be traced back to 1593 locally, which is more than what we have on the history of Brook Place – but that’s a story for another day.